Fed up of overly complex supplements containing a long list of ingredients and additives you don’t understand? We are too. That’s why we developed HMB+ Creatine™. HMB+ Creatine supplement is a simple, naturally occurring, science backed supplement that both supports muscle cell health and energy systems. Using it on a regular basis results in less muscle cell damage after strenuous exercise and improved energy for training. This leads to quicker recovery and faster muscle strength gains with training. HMB+ Creatine supplement is made from two simple ingredients found in natural, healthy foods. It contains no additives, preservatives or fillers and is for the athlete concerned about what goes into their body. HMB+ Creatine supplement is an ideal supplement for strength focused athletes that push their bodies to extremes, such as strength focused CrossFitters, Olympic weight lifters, gymnasts, sprinters or sportsmen/women. What will taking HMB+ Creatine supplement do for me? HMB and Creatine are two of the most researched sports supplement ingredients on the market having been tested in over 100 science labs across the world. 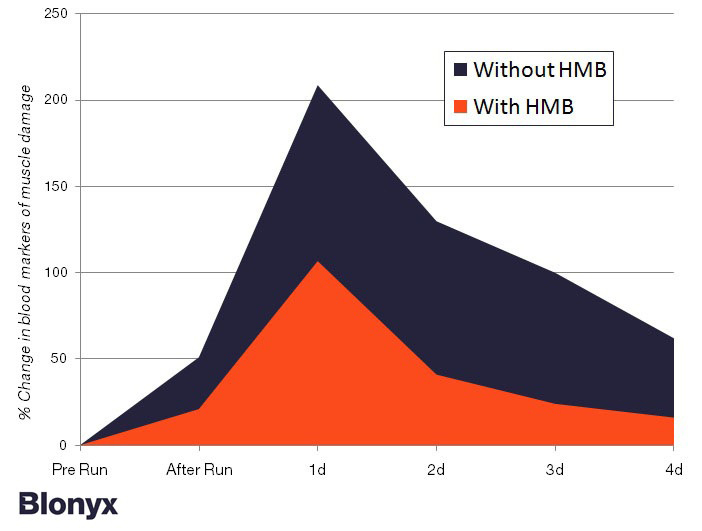 This research found that HMB reduces the muscle damage caused by heavy weight training while allowing quicker recovery and improved performance in the next training session. Creatine on the other hand, increases both muscle mass and strength when combined with heavy lifting or sprinting. Researchers looking at both HMB and Creatine together found that they combine well to enhance both strength gains and muscle mass gains by over 100% more than using a placebo supplement. They are considered by many to be the best combination products for strength building. Click here to learn more about the research. Is HMB+ Creatine safe to take? Blonyx HMB - Keep on Running Extensive clinical studies have been conducted to specifically evaluate the safety of HMB with no negative side effects being observed in both men and women whether young or old. Creatine has been widely used for years with little recorded side effects. Where recent research indicates that it is completely safe, it is thought that there is a chance people with kidney failure may be negatively affected by its ability to pull water into the muscles. Why choose Blonyx HMB+ Creatine? Blonyx HMB - Keep on Running There are only a few companies that are licensed to sell HMB based products in North America (go to www.hmb.org for a full list). 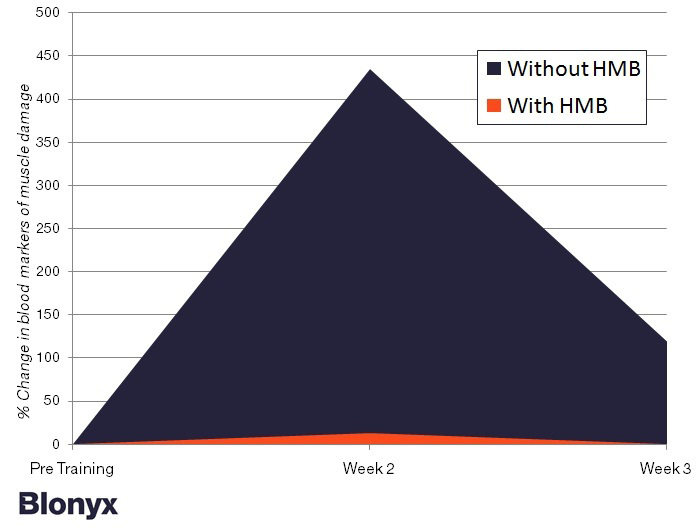 Unlike the other legitimate HMB products, Blonyx products contain no additives or fillers and are for the athlete that is concerned about what they put into their body. What does HMB+ Creatine contain? HMB+ Creatine contains nothing more than calcium HMB (HMB is bound to calcium to help with absorption) and Creatine Monohydrate in a powder form. HMB is found naturally in healthy foods like grapefruit, alfalfa and catfish and is also made in small amounts by the body. It is stored in muscle cells and helps maintain their structure and function. Creatine, found naturally in meat, is also stored in muscle cells and provides energy for explosive muscle contractions like in sprinting or lifting heavy weights. HMB+ Creatine contains no additives, preservatives or fillers. It is the purest HMB and Creatine combination product available today. Like all Blonyx supplements, HMB+ Creatine’s ingredients are consistent with the paleo diet ethos as they are all from foods that would normally exist in a hunter-gatherer’s diet. It is highly likely that meat eating cavemen living amongst the grapefruit trees were the fittest around. Who should take HMB+ Creatine? Blonyx HMB - Keep on Running HMB+ Creatine is for athletes who train hard and regularly with heavy weight. It is ideal for weight lifters, bodybuilders and strength athletes. The muscle weight gain associated with Creatine supplementation may also appeal to certain sportsmen/women such as rugby or football players.